I normally loathe making step-by-step guides. When I cook and am in the zone, it’s hard for me to break the flow and take out the camera. 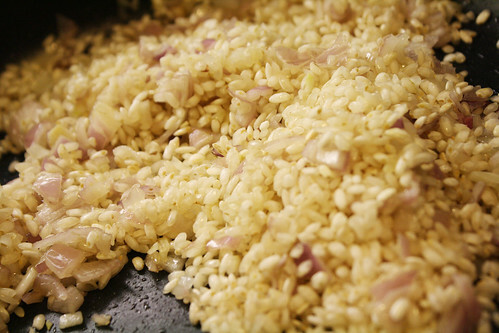 But, risotto is such a lengthy process, that it’s a little easier. These step-by-step guides take forever to write and assemble though, so enjoy this one while it lasts. 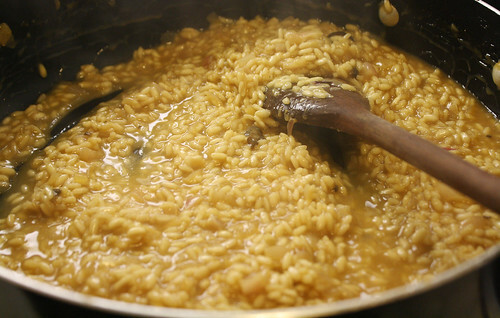 I have found that the key to good risotto is constant stirring for about 50 minutes to an hour, on medium-low heat. This requires a glass of wine, a chair to sit on, and some sort of book or smartphone to get you through the hour. It’s going to get hot and sweaty and your arm will feel like falling off. At one point I whined to Dhiren that I was feeling dizzy, and he rescued me while I sat in the living room in front of the fan. So, it helps to have a significant other nearby to take over for you if you’re weak, like me. 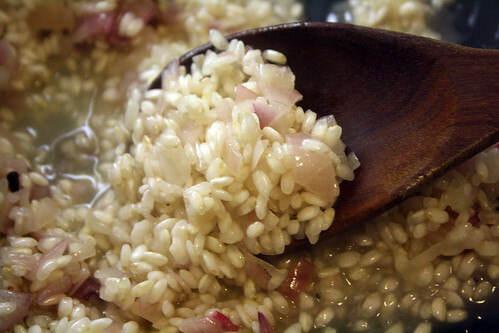 Here’s my step-by-step guide to a delicious risotto, adapted from this version on All Recipes. 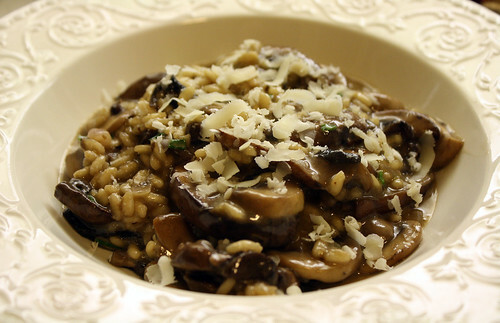 Combination of portobello, white mushrooms and/or crimini. I used a combination of all three. Use as much as you like. I used two portabellos, a bag of Crimini and 1/2 pound of white. It depends on your preference. Step 1: Prep your ingredients. As you need to be in front of the pan stirring, you won’t have time to chop and grate, so do it before. 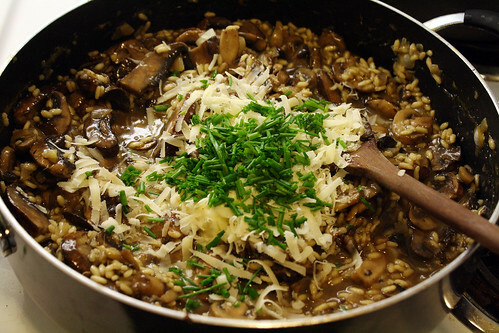 Clean and chop all your mushrooms & shallots, grate the Parmesan and have everything measured out. Step 2: Heat up the chicken broth in a separate pot. 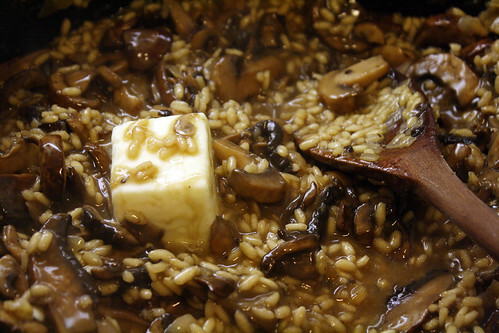 Step 3: In a big skillet, heat up some oil and cook the mushrooms until soft. They won’t be cooked much longer after this point, so be sure they are done. 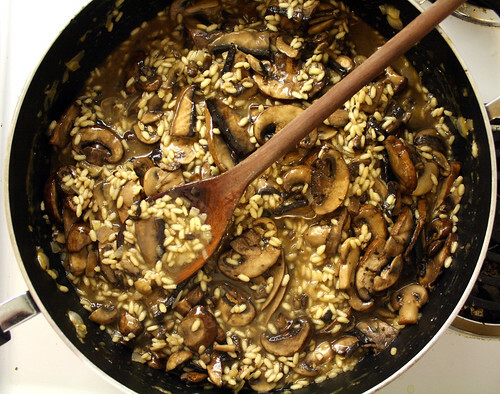 Pour the juice and mushrooms into a bowl and set aside. Step 4: Heat some oil in the large skillet, and then saute the shallots until light. 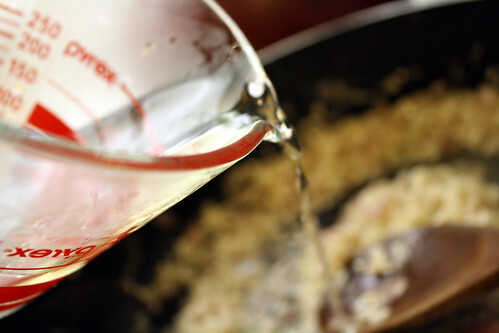 Step 5: Pour in the rice and stir continuously until slightly clear. 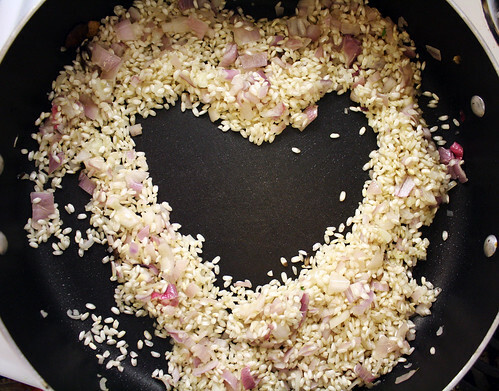 Step 6: Play with your rice. Step 7: Slowly pour in the wine, little by little and stir until it is fully incorporated. Step 8: Add the chicken broth one ladle at a time, stirring constantly. Do not add the next ladle until all the broth is incorporated. This step should take anywhere from 50-60 minutes, depending on your skillet and heat. I like the starch to release slower, which takes a lower heat and more stirring. The rice should ooze like lava, but still remain a little al dente. Mushy risotto is no good. Step 9: Once all the broth is incorporated, remove from heat and mix-in the mushrooms, butter, chives and Parmesan. Step 10: Serve immediately and enjoy with wine and a salad.